March Madness is right around the corner with 68 teams (and fans) eager for upsets, buzzer beaters, and bragging rights. If you and your family want in on the action, visit our top sports spots that are kid, parent and b-ball friendly. Read on to find out more. The Independent is located in the historic Broadway Lights District. Everything about The Independent screams “BASEBALL”, as it was inspired by the Portland Mavericks. But, with 32 flat panel TVs and a projector screen, you will always find your game on, no matter which sport you love. Locally owned and operated by the same people that brought us The Station, this spot loves kids as much as they do sports. There’s a Little Leaguers menu, and they serve Football Breakfast on Saturday and Sunday mornings from 9-11. I mean, what kid doesn’t love TV and breakfast?! The Independent is proud to offer every fan a great seat, however parking can be a bit tricky so use the parking garage next door or get there early for street parking! If you’ve ever been to a Punch Bowl Social location (and there are many), then you know why it’s on the list. PBS Portland is the biggest one yet, with 32,000 square feet of fun and entertainment for all ages. There are flat screen TVs throughout the space, for your viewing pleasure, but you don’t just have to sit and watch the game. Choose from bowling, shuffleboard, karaoke, billiards, ping pong, giant Jenga…the list goes on and on. There are also a variety of spaces you can rent, if you want to thrown your own Game Day bash. Kids are welcome until 10 p.m., and the Kid’s Menu features fun classics like Sloppy Joes, hot dogs, and spaghetti and meatballs. Speaking of which, the food at PBS is a cut above your typical sports bar. They use only grass fed, hormone-free beef, and hormone- and antibiotic-free chicken. Breakfast is served until 3 p.m., and you won’t want to miss the Monkey Bread French Toast or Chicken and Waffles. I’m getting hungry just writing about it. Giving you the opportunity to play, party and watch all in one location, Big Al’s is a great place to bring the whole team. 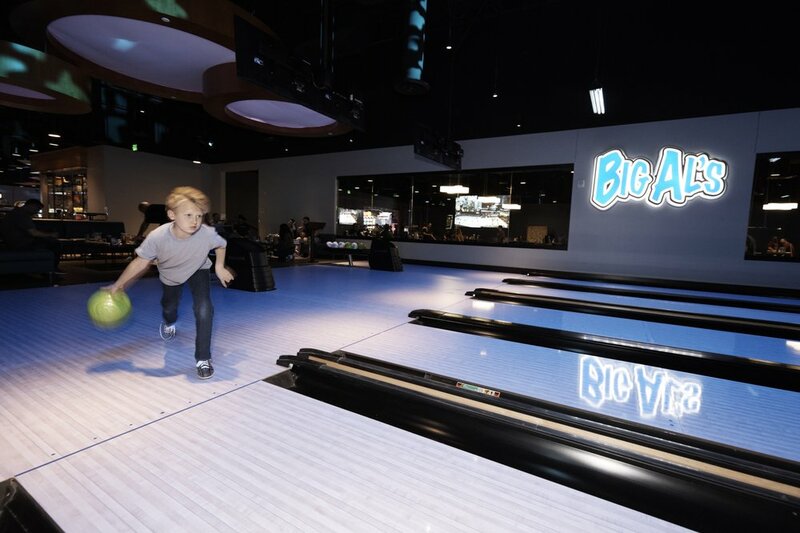 Between 42 bowling lanes, shuffleboard, billiards, and even a 7,000-square-foot arcade, Big Al’s is a mainstay that entertains children and adults of all ages — even if they don’t have the attention span for an entire football game. Catch Super Bowl LIII on their 55-foot HD projection screen with stadium style seating. This year, Big Al’s promises the BIGGEST game, the BIGGEST screen, and the BIGGEST party, with an all-you-can-eat menu, unlimited soda, reserved seating, and pre-kick off giveaways and prizes, for $50/person. Be sure to purchase your tickets ahead of time! Portland’s destination for sports, Blitz Ladd has 32 TVs and superior service so you won’t miss a thing. With an arcade, games, and one of those challenging plush toy machines there’s fun for everyone. If your game is on during happy hour you can enjoy $1 off all draft beers and well drinks. Swish! They boast 36 beers on draft including local award winning craft brews. This spot is open to minors until 9 p.m.
Insider tip: Happy hour takes place daily from 3 p.m. to 7 p.m. and offers drink and food specials. They asked and we can’t figure out an answer. There’s countless reasons to have fun at YNOT: laser tag, arcade games, and a bar and girl. Older kids can go play games while you watch the games. There are no age or height limits for laser tag they recommend being over the age of six because the packs are about 6 lbs. With laser tag games that last 25 minutes and generally no reservation required for parties under 12, it’s a great way to start your own kind of madness or finish the night off. Fuel up on sandwiches, wraps, pizzas, or salads. Insider tip: Happy hour takes place everyday 3 p.m. to 6 p.m.
Migration Brewing is all about making moves towards your dreams and your beer. This neighborhood favorite is the spot for families to enjoy not only March Madness but Timbers and Blazers games. They rep straightforward pub grub (mac n’cheese and chicken sandwiches) that will appeal to all ages. If the weather is in your favor when you go, they have an extensive patio. Minors are welcome until 8 p.m.
Insider tip: Happy hour takes place weekdays 3 p.m. to 5 p.m. and offers beer, wine and food specials. Named for the spirited 1977 season the Trail Blazers had with Bill Walton leading the legitimization of Portland as a sports city, this is a great spot to watch others make history this season. We recommend you bring bigger kids (who’re old enough to safely navigate the tall bar stool seating) to enjoy the game with you. From The Buzzer Beater Basketball Arcade to skee-ball, and pinball to “Baby Foot” foosball there’s plenty to do if kids get a little restless. Minors are allowed until 10 p.m., so go ahead and cheer for overtime. 500 NE MLK Jr. Blvd. Insider tip: Happy hour takes place weekdays 3 p.m. to 6 p.m. and offers drink specials. Lovingly called B-Dubs by regulars, BWW is a premier spot for sports fans of all ages. They even support kids’ sports with their Team Up for Kids program. Each venue has a line-up of football food favorites that let you and your family go all out, no matter what you and your little buffalos are craving. They have highchairs galore, plus cute little crowns for kids (or adults feeling like having some fun). With 30-plus flat screen TVs across the dining room and bar, you can catch all the action. There are eight locations in the Vancouver-Portland area, so you’re sure to find one near you. Is your home team in Sellwood? Since 1999, this neighborhood staple has been the go-to sports bar. They come with a stacked lineup featuring a non-smoking, friendly atmosphere just three blocks from Westmoreland Park; 20 beers on tap and more than 18 TVs, including 92-inch and 102-inch projector screens. While they do not have a kid specific menu, everyone in your party is bound to find something they love with a classic menu that includes everything from burgers to sandwiches to salads (plus breakfast on weekends!). Insider tip: Happy hour takes place weekdays from 4 p.m. to 7 p.m. offering drink and food specials. This friendly neighborhood gastropub transforms into a sports bar in a moment’s notice. Located in the historic Northwestern Electric Company building, they are the go-to place to watch your favorite local NW teams. The Station is more than welcoming to all the short stops on your team, with a dedicated “Kid’s Zone” that has chalk boards, magnet toys, games, and more. Parents can watch their little players while enjoying a pint anywhere in the restaurant, and still follow the game on one of six large flatscreen TVs and two enormous drop-down projector screens. For the home field advantage, reserve your private table to get in on all the Super Bowl LIII action! Starting at $20 for a 2-person table, your reservation includes guaranteed seating, your choice of Super Bowl food specials, and beer from Rogue Ales. Raffle prizes will be given each quarter, and a Grand Prize package awarded to one lucky winner!